Congratulations to new Cultural Tattoo practitioners! To start the year IOTA partnered with Earthline Tattoo Collective to present this year's Earthline Tattoo School 2019 - K’jipuktuk. Congratulations to new Cultural Tattoo practitioners, Quill Christie-Peters, Stacey Fayant and Mila Waseskwan! IOTA gratefully Acknowledges the Canada Council for the Arts support for this project. The Art Gallery of Nova Scotia for their special partnership hosting the Tattoo School and Night:Skindigenous. A warm thank you to all those who followed along with the revival of this cultural practice right here in K’jipuktuk (Halifax) and attended the IOTA presented Earthline Tattoo Demonstration and Discussion. This last month saw re-discovery, revival and the promising future of Indigenous Tattooing and IOTA was honored to share it with you all. Introducing the cultural tattoo practitioners and visual artists that make up Earthline Tattoo Collective, Jordan Bennett, Amberley John, Dion Kaszas, Amy Malbeuf and the 2019 Programs Coordinator Audie Murray. Over the past 10 years, Jordan has participated in over 75 group and solo exhibitions nationally and internationally. 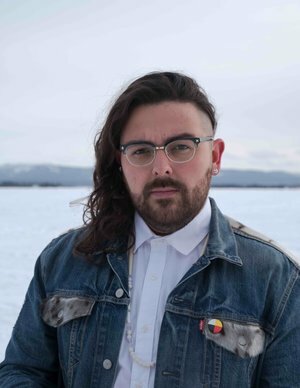 He has been the recipient of several awards and honours, a Hnatyshan Foundation REVEAL award, presented with the 2014 Newfoundland and Labrador Arts Councils Artist of the Year and named as one of the artists in the 2014 Blouin ARTINFO's Top 30 under 30 in Canada. Most notably, he has been long-listed for the 2015 and 2016 Sobey Art Award, and was short listed for the 2018 Awards. Jordan is currently partnered with IOTA: STUDIOS, and working on several projects including various artistic collaborations, public commissions and exhibitions, including a newlyaunched public art commission for the Zatzman Sportsplex in Dartmouth, N.S. and a solo exhibition at the Art Gallery of Nova Scotia. Amberley John is Onyote’aka (bear clan) and the newest member of the Earthline Tattoo Collective. She trained in handpoke and skin stitch tattooing methods at the 2017 Earthline Tattoo Residency in unceded syilx territory (Kelowna, BC), where she is still currently a graduate student working to complete a Master’s in Fine Arts Interdisciplinary in Indigenous Studies, at the University of British Columbia. As an emerging artist and cultural tattoo practitioner Amberley is interested in exploring her responsibilities to multiple communities through her creative practice. It is generally understood that Bear clan members have a responsibility to learn about medicines and support healing. She focuses on Haudenosaunee designs and motifs, but also collaborates with individuals from different nations to find common or appropriate imagery. She feels that tattoos are marks of intergenerational healing. Earthline’s care for health and safety education with regards to preventing the spread of blood borne pathogens, taking care of people with various health concerns and cultural safety is critical, as our communities strengthen our traditional practices and renew old friendships between nations. 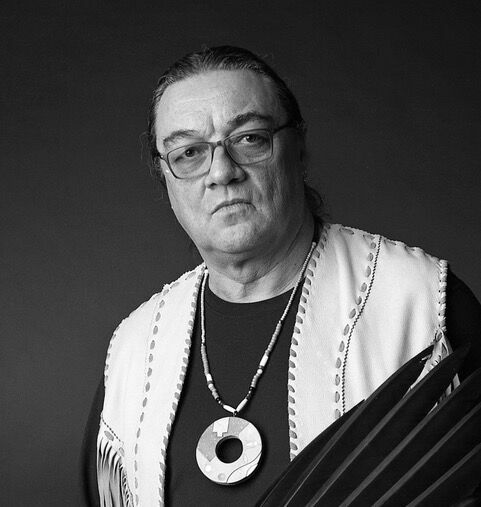 Dion Kaszas is a tattoo artist, cultural tattoo practitioner, painter, teacher, and scholar of Hungarian, Métis, and Nlaka’pamux (Interior Salish) heritage. He works in the artistic mediums of oil, watercolour, graphite, mixed media collage and video. 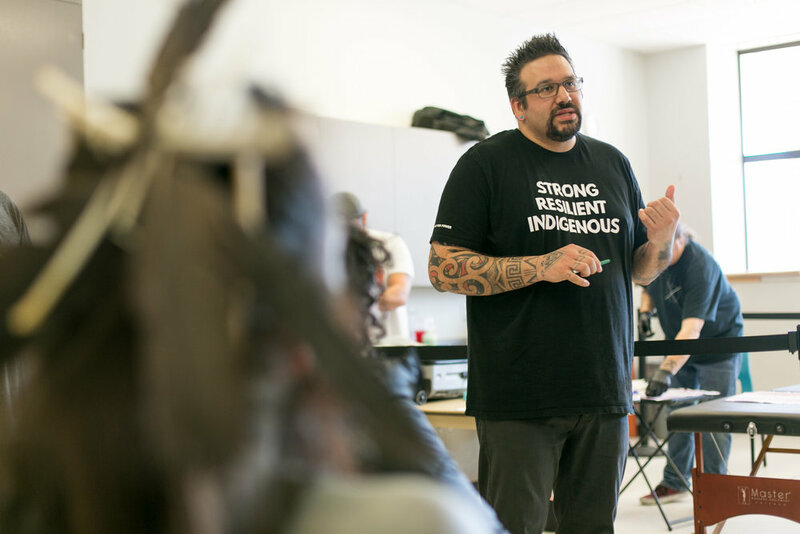 Dion’s passion for tattooing extends beyond his artistic work into a Masters degree in Indigenous Studies at the University of British Columbia Okanagan in Kelowna, British Columbia. 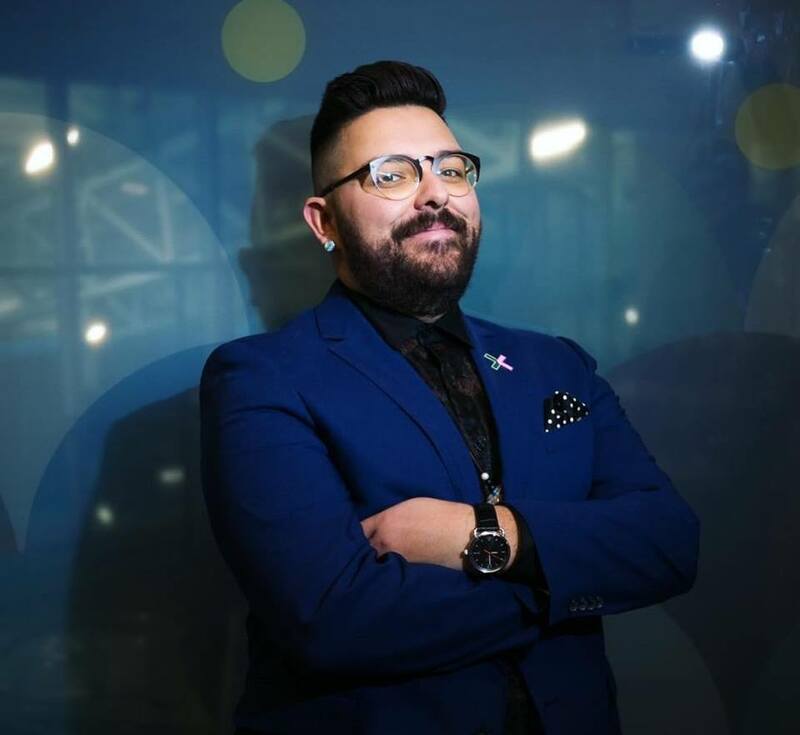 His area of research is Indigenous tattooing, focusing keenly on the revival of Indigenous peoples tattooing practices, using Indigenous and creative research methodologies. Dion is one of the founding members of the Earthline Tattoo Collective which aims to enhance, expand and support the work of traditional and cultural Indigenous tattoo practices across Canada. Dion can be found on Instagram. Amy Malbeuf is a Métis visual artist and cultural tattoo practitioner from Rich Lake, Alberta in Treaty Six territory. She lives and works on unceded Mi’kmaq territory in Terence Bay, Nova Scotia with her partner in life and art Jordan Bennett. Malbeuf creates art works in mediums such as animal hair tufting and embroidery, beadwork, sculpture and installation. As a textiles based artist it was a natural transition for Amy to apply her hand-sewing skills to the skin-stitch tattoo method. Amy tattoos in both hand-poke and skin-stitch techniques, however she specializes in the skin-stitch method. Amy is focused on the revival of Indigenous women’s tattooing, particularly within Cree tattoo practices. Amy holds a Native Cultural Arts Instructor Certificate from Portage College and an MFA degree in Visual Art from the University of British Columbia Okanagan. In 2015 she co -founded Earthline Tattoo Collective with Jordan Bennett and Dion Kaszas. Amy can be found on Instagram. Audie Murray is a multi-disciplinary Michif artist from Saskatchewan currently learning and creating on the unceeded territories of the Coast Salish peoples. She has completed a visual arts diploma at Camosun College in 2016 and a Bachelor of Fine Arts at the University of Regina in 2017. She has studied traditional tattoo practices with the Earth Line Tattoo Collective in the summer of 2017 and continues to work with hand poke and skin stitching methods. She will be working with the Earthline Tattoo Collective during the 2019 residency as the program coordinator. In 2018 she was the recipient of the William and Meredith Saunderson Prize through the Hnatyshyn foundation. Audie has shown her works at various events and spaces in Canada including Open Space, Victoria(B.C. ); the Mackenzie Art Gallery, Regina (SK); the Alberta Art Gallery, Edmonton; the Clay and Glass Gallery, Waterloo (Ont); Hamilton Artist Inc (Ont); and the Justina M. Barnicke Gallery, Toronto (Ont). Audie Murray can be found on Instagram. The 2019 Earthline Tattoo School Guest Mentors! 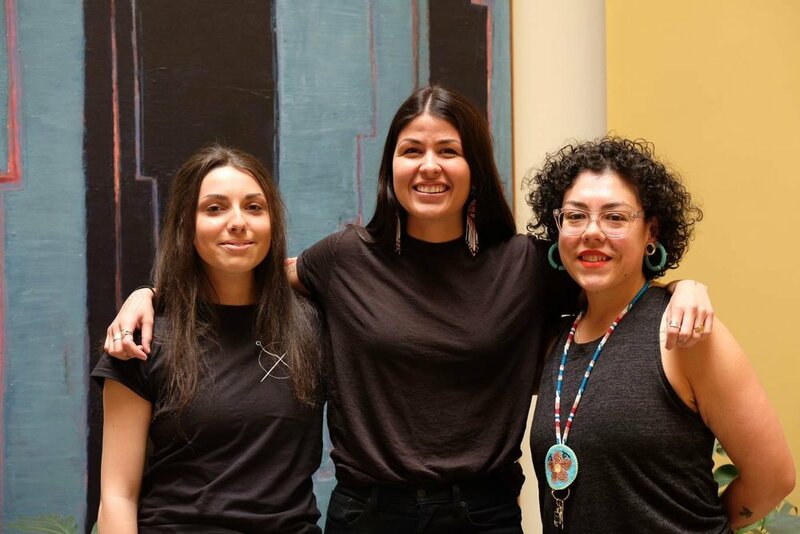 To guide them on their journey in (re)learning the cultural practice of Indigenous tattooing the 2019 Earthline Tattoo School participants will be working with inspiring guest mentors, Jerry Evans, Julie Paama-Pengally, Nakkita Trimble and Nahaan. Jerry Evans is Mi’kmaq born in central Newfoundland. In 1986 he graduated from the Nova Scotia College of Art and Design with a Bachelor of Fine Art. He completed an Education Degree at Memorial University of Newfoundland and Labrador and has been a practicing Visual Artist for over thirty years. Primarily a painter and printmaker, Jerry is also is a multi-media artist who has worked in film, has qualified and reclaimed traditional single poke tattoo as a means of expression and gift exchange, and has created regalia for his own pow wow dancing for more than a decade. You can find Jerry and his work on Instagram. Julie has been at the forefront of developments in Māori Arts since the mid 1980s and was fortunate to have been taught herself by strong visionary Māori artists and mentors.Julie focused her passion onMāoritattooing traditions post-1990,enlightened to the role that Tā moko could play in advancing the health and well-being of Māori. Vocal in her conviction that within Māori pedagogy body marking serves as powerful communicator,Julie has equally advocated for the restoration of Māori women within itspractice. Active inTā moko during its fledgling revival, Julie pioneered the role of women as practitioner and the entitlement of women to wear particular types of moko.In 2004, Julie was commissioned -along with new Zealand’s foremost Tāmokoartists -to perform her practice publicly at Te Papa National Museum during which time she tattooed full pehaor puhoro (covering lower back, hips and thighs to knee)on two women. While consistently challenged on the involvement of women in customary Māori art practices, Julie has responded by directing leadership in research and social commentary on Māori arts. In 2010, shepenned the award-winning book Māori Art & Design, the first comprehensive handbook on the subject. Julie holds Masters qualifications in Third World Development and Māori Visual Arts (honours) as well as Toi Iho certification –a unique registered Aotearoa New Zealand trademark of Māori quality and authenticity –for Tā moko, design and multimedia.While operating a successful studio in Mount Maunganui, Julie is particularly enthusiastic to make connections with other indigenous peoples reviving their tattoo practices. You can learn more about Julie and her work on her website, or follow her on Instagram and Facebook. Nahaan’s matrilineal lineage is of the Tlingit, his grandfather is Iñupiaq, his biological father of the Paiute and his actual father is of the Kaigani Haida. He focuses exclusively on working within the spirit and design style of the Northwest Coast practices and customs of ceremonial tattooing, wood carving, copper and abalone jewelry, painting and custom designing of regalia and tattoos. Nahaan emulates the strong visual and oral storytelling that has been handed down from generation to generation, it’s the foundation of his work, way of living and teaching of his cultural traditions. 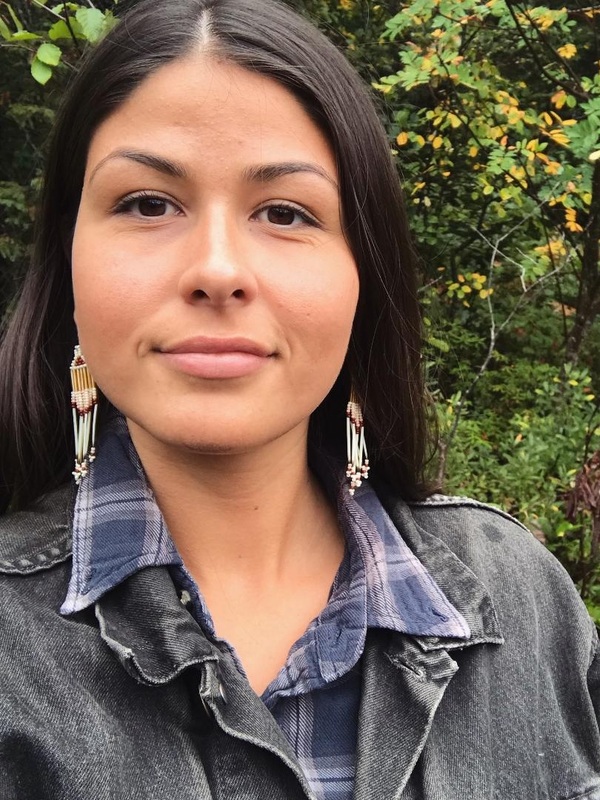 Within the realms of language arts and expression, Nahaan teaches the Tlingit language through traditional songs, dances and free Indigenous only community classes. He is the leader for Tlingit based inter-tribal group Náakw Dancers, a group he started in Seattle, Washington in 2014, in order to perpetuate the rich expressions of the Pacific Northwests Native population. Nahaan is also a spoken word poet and co-founded “Woosh Kinaadeiyeí” poetry slam in Juneau, Alaska in 2010 which has since grown into a thriving and creative mainstay in the capitol city. He is also a vocalist for Khu.éex’ a Seattle based band that presents a contemporary interpretation of Tlingit culture. He focuses on the aspects of community empowerment and self mastery through the methods of dekkkolonization, Indigenization, education and activism. He offers workshop facilitation and keynotes for conferences and events near and far. You can find Nahaan and his work on his website, or follow him on Instagram, Facebook, youtube and Soundcloud. Nakkita Trimblehl waý, ii Algaxhl Gwilks-ḵ'alt'amtkwhl wam aluugigadiý. Ksim Ganada ńiiý, ii Gingolx wil ẃitgwiý. Nisga’ahl nooý, ii Tlingithl nigwoodiý. Rose (Gurney)hl wahl agwii-nits’iits’iý, ii Christopher Trimblehl wahl agwii-niye’eý.My name is Nakkita Trimble. My Nisga’a name is Speaking Through Art. I am from Wilps Axdii Wil Luugooda, The House that is Never Empty. I am Frog clan and maternally from Gingolx, British Columbia. Maternally I am Nisga’a. My great grandparents names are Rose (Gurney) and Christopher Trimble. My great grandparents were one of two of the last arranged marriages from my village. I began tattooing in 2011. I began working on the Nisga'a Tattoo revival in 2013/2014 with the Council of Elders (CoE) comprised of some Chiefs and Matriarchs of the four main Nisga'a villages in the Nass Valley. With my Nation's support we laid the groundwork for the revival for our people. You learn more about Nakkita and her work on her website, and follow her on Instagram. The Earthline Tattoo Collective in partnership with IOTA Institute will be hosting a public tattoo demonstration Saturday, March 9th at the Natural History Museum. The event will start at 2pm with an introduction from Dion Kaszas and will feature a hand poked tattoo demonstration done by Jordan Bennett. The demonstration will be followed by a conversation with the cultural tattoo practitioners of Earthline Tattoo Collective: Jordan Bennett, Amy Malbeuf, Dion Kaszas and Amberley John. This event takes place one month after the new Safe Body Art Act has come into action and will be followed by a conversation and question period on health and safety practices and the creation of safe spaces when teaching traditional Indigenous tattooing. IOTA gratefully Acknowledges the Canada Council for the Arts support for this project. Note on access: ASL interpretation will be made available on site. The Tattoo Demonstration is taking place on the bottom floor of the Museum and can be entered through the right side entrance next to the available parking lot. This event is FREE and open to the public, Register here. For any updates about this event check out our Facebook event. The 2019 Earthline Tattoo School Participants! Over the last week IOTA has taken the time to highlight those participating in the 2019 Earthline Tattoo School, Quill Christie-Peters, Stacey Fayant and Mila Waseskwan. The land is everything,for Mila. She is a nîhiyaw iskwîw(Cree Woman) born and raised in the sâkawnîhiyaw(Bush Cree) community ofkîto sâkahikan(Calling Lake, Alberta). Here, learning nîhiyawculture and ways of knowing and fulfilling her responsibilities,she feels truly humbled. 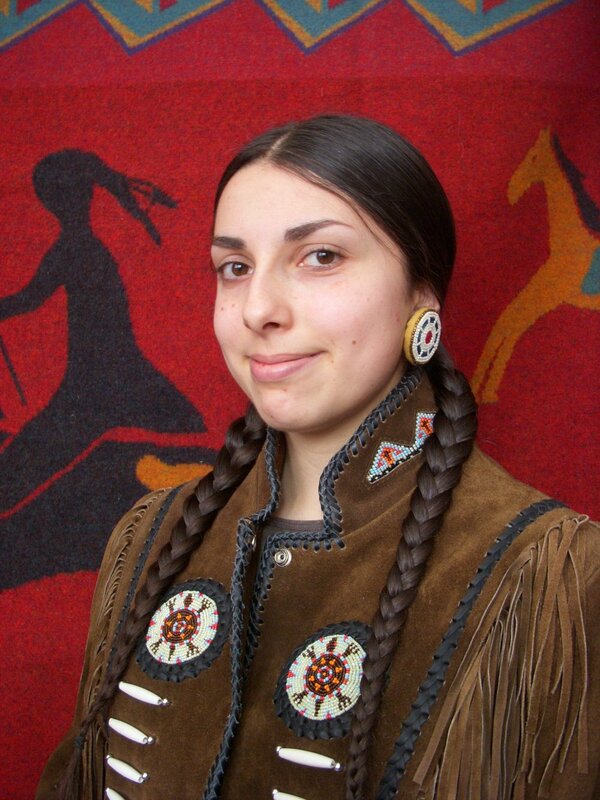 She practices traditional skills such as hide tanning, beadwork, quillwork, as well as contemporary art skills, and is also a jingle dress dancer.She is committed to live her life in the forest, to strengthen and live her relationship and love for our mother the earth. She believes that this is the place, which provides all things needed to physically and spiritually live. Learning to live nîhiyaw isîhcikîwi(cultural ways connected to mother earth),Mila is helping restore the traditional oskâpîwis (helper) society within her community.Learning about and living more according to the lifeways of the ancestors, Mila’s life focuses on intergenerational resilience, healing and resurgence. Quill Christie-Peters is an Anishinaabe arts programmer and self-taught visual artist currently residing in Northwestern Ontario. She currently works as the Director of Education and Training for the aboriginal curatorial collective where she is coordinating the Emerging Curatorial Training Program. She is the creator of the Indigenous Youth Residency Program, an artist residency for Indigenous youth that engages land-based creative practices through Anishinaabe artistic methodologies. 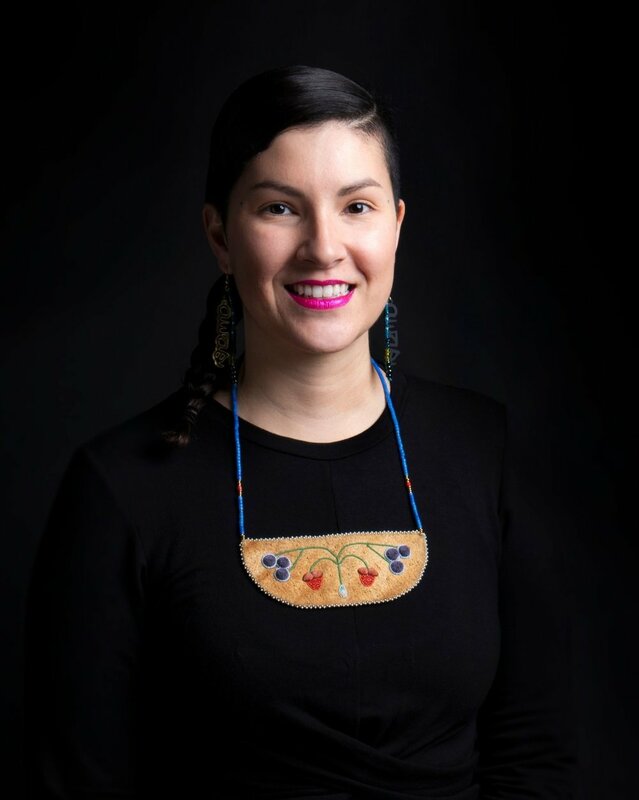 She holds a Masters degree in Indigenous Governance on Anishinaabe art-making as a process of falling in love and sits on the board of directors for Native Women in the Arts. Her written work can be found in GUTS Magazine and Tea N’ Bannock and her visual work can be found at @raunchykwe. She received a Bachelor of Fine Art in Printmaking and Painting and a Bachelor of Art in Women's Studies from the University of Regina, in 2002 and 2004. Stacey currently serves as Chair of the Board for Sâkêwêwak Artist Collective. She is a self-taught milliner and creates other art pieces that are sold locally and internationally. She is currently working on a large scale project that explores identity, history keeping, and how those ideas can create or destroy comfort. Having utilized body modification as self-therapy Stacey became interested in how personal aesthetics relate to identity and self-valuation. She then became aware of tattooing traditions practiced in North America and she felt a pull to learn more and become involved in helping reinvigorate Indigenous tattooing. Stacey can be found @staceyfayant. IOTA is excited to announce its partnership with the Earthline Tattoo Collective in presenting this year's Tattoo School, an opportunity for Indigenous artists to (re)learn their craft. This important initiative will take place on Mi'kma'ki in Kjipuktuk (Halifax) between February 9th and March 16th, 2019. The Tattoo School is held at the Art Gallery of Nova Scotia, who will also host a public artist talk. The Earthline Tattoo Collective in partnership with IOTA will host a tattoo demonstration open to the public and a youth workshop in early March. The public demonstration held at the Museum of Natural History March 9th, will be an opportunity for a broad audience to come together and discuss safe and healthy practices and spaces when teaching traditional Indigenous tattooing. We would also like to congratulate the 2019 Earthline Tattoo School participants: Quill Christie-Peters, Stacey Fayant and Mila Waseskwan and the cultural tattoo practitioners and visual artists that make up Earthline Tattoo Collective, Jordan Bennett (Mi’kmaq, NS), Amberley John [kʌniyewʌna (Bear Clan), ON], Dion Kaszas (Nlaka'pamux, BC), and Amy Malbeuf (Métis, NS). The Tattoo School will also be welcoming tattoo practitioners of international caliber and expertise as guest mentors. Information about Earthline Tattoo Collective, their guests and what events are open for local participation will be made available in the coming weeks @IOTAintitute, including an inside look at the Tattoo School as strides are made in reviving an important cultural practice. Female tattoo artists are Danika Nacaarella (forefront) and Maannii Oakes (background) . The final launch of our web art series by Canadian artists Jennifer Chan 'Important Men', Liz Solo 'The Wide Sky' and J.R. Carpenter 'This is a Picture of Wind'. A cinematic dome residency and the world premiere of her immersive experience 'Cyberhive' with Ruth Marsh. 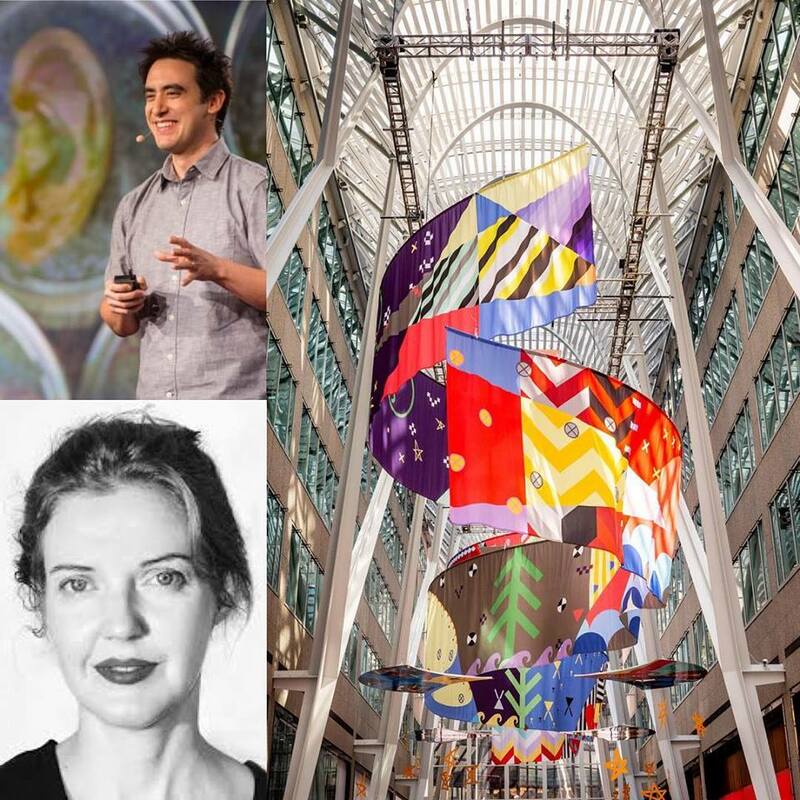 Three Jordan Bennett public art commissions, one of which will be presented to the public in 2019 at the Zatzman Sportsplex. A very first Bio Art residency by WhiteFeather Hunter in collaboration with SMU and the Milieux Institute that focused on the soil remediation project 'Prospective Futures:The Aurelia Project'. An artist talk with Earthline Tattoo Collective that discussed the revival of Indigenous tattooing traditions and how it can revive artists’ ancestral traditions. Closing out the year we even released two new e-publications that can be downloaded for free. 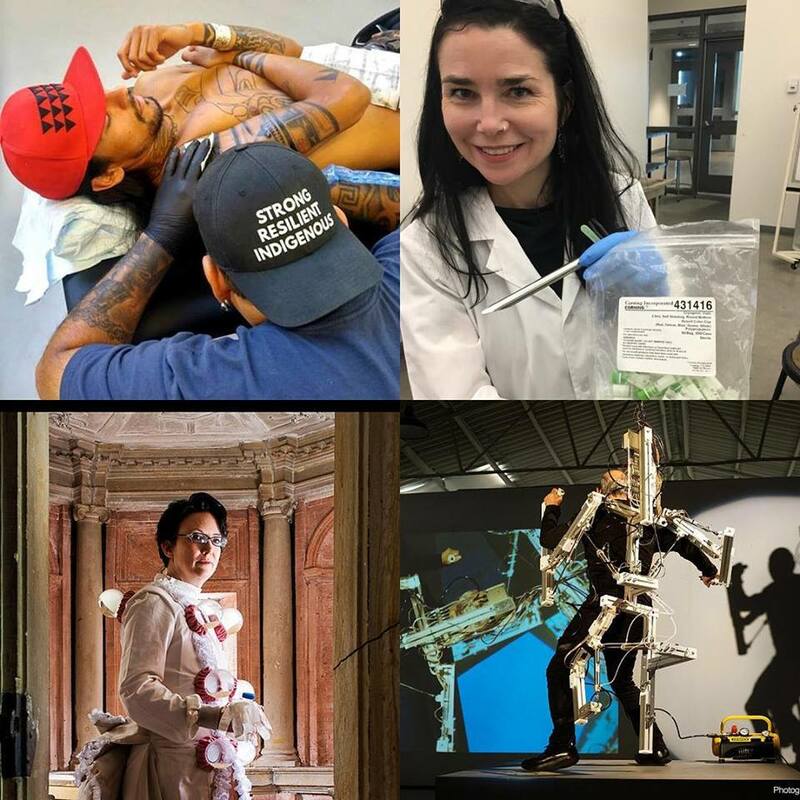 As we move forward into 2019, IOTA will bring you more from these returning artists with focused Bio Art events in the form of artist talks, gallery exhibitions, spectacular performances and new installations, including first-time visits by Stelarc, Nina Sellars, Andrew Pelling, and Jennifer Willet. We are also pleased to greet 2019 with our brand new website which will be coming soon, furthermore, keep your eyes peeled on our social media for updates on the February launch of the Jordan Bennett Sportsplex public art piece and the start of the Earthline Tattoo School. We look forward to evolving IOTA with you all in the coming year! IOTA: ARC presents the dome after dark for a 15-min stop-motion, sound and video piece which conjures a technologically altered, large-scale beehive. This Immersive Experience is created by Ruth Marsh is a 360 degree video with original music and sound design by Jeremy Costello. The new work is presented by IOTA Institute and was supported via a 2-month artist residency in the Seadome. With contributions to IOTA: ARC residency’s IndieGoGo campaign and with other private donations this Ruth Marsh #immersive #dome residency will be possible. Look for updates on all platforms of social media @IOTAinstitute! Full IOTA Project Page HERE. Ruth Marsh and IOTA in the CBC News! "This summer, Marsh is teaming up with IOTA Institute, a Halifax-based arts organization, for what's called an immersive cinema artist residency. She plans to broadcast her animation inside a nine-metre 360-degree dome that's meant to mimic a living, breathing beehive." See full CBC Nova Scotia article by journalist Emma Smith HERE. Jordan Bennett Shortlisted for Sobey Art Award! IOTA sends our most enthusiastic congratulations to Jordan Bennett for being shortlisted for the Sobey Art Award / Prix Sobey pour les arts ! Congratulations to all the artists! IOTA is proud to announce that Jordan Bennett has been selected for the creation of a new signature public artwork for the Dartmouth Sportsplex, and IOTA is SO incredibly pleased to be a project partner. Follow us on all social media platforms @IOTAinstitute to see the art in progress! IOTA has launched a crowd funding campaign in Indiegogo! 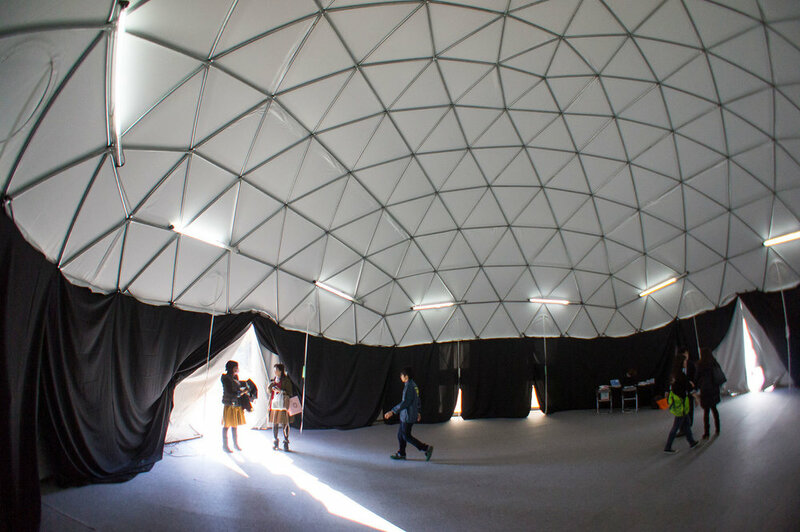 Our new initiative, the IOTA: ARC pilot residency program takes place in a 30 ft geodesic dome with an 360° cinematic interior; an artist will learn the technology necessary to support the creation of a new immersive experience. 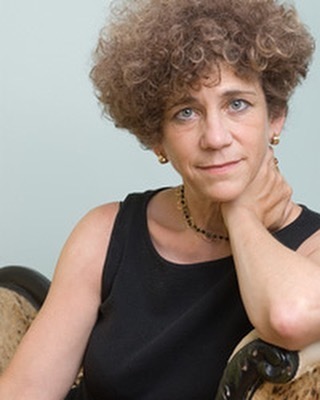 We've invited Halifax based artist Ruth Marsh to pilot the residency! The Immersive Experience is a 15-min stop-motion, sound and video piece. 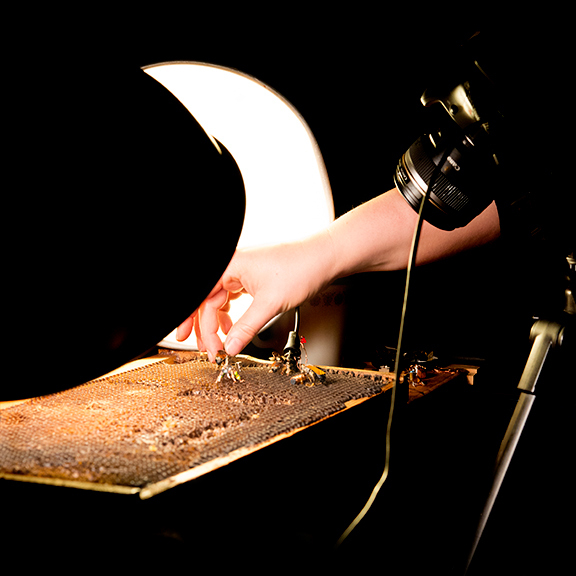 The film will feature several hundred cyborg bees for this immersive environment. The presentation will invite viewers to enter into a technologically altered, large-scale beehive. Support our pilot immersive cinema artist residency! J.R. Carpenter’s web piece “This is A Picture of Wind” will expand upon a short text written in response to the storms which battered South West England in early 2014. IOTA is undertaking a structural change that will better reflect an interactive online space, new services to artists, and exciting announcements in early 2018. IOTA continues to be a producer of contemporary cross-disciplinary art discourse focusing on art forms that are based in technology, social interventions, and science.